The blog has been quiet lately due to the work I have been putting in to my non profit. It’s been such a great experience and after some sleepless nights, we are now formed. Women Entrepreneur Resource & Educational Community is a 501(c)(3) non profit. The mission is to provide educational resources to women entrepreneurs. Our first large scale fundraiser is on April 28th from 6-9pm. Details are below. My team and I would appreciate any donations, silent auction items or volunteer services. 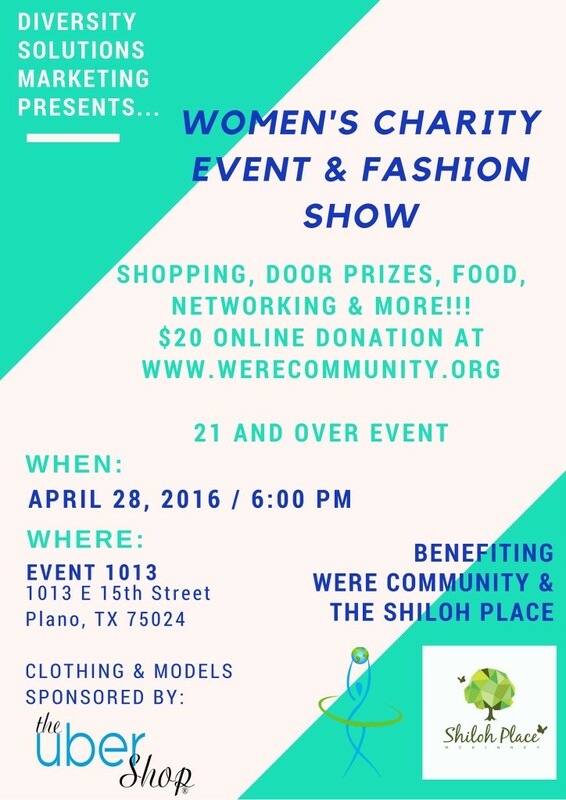 For more information, please email Stephanie@WERECommunity.org or Stephanie@DiversitySolutionsTX.com and we’ll get you squared away!!! Women’s Charity Event & Fashion Show benefiting Women Entrepreneur Resource & Educational Community-WERE Community and Shiloh Place, both serving the local community. Clothing & models provided by The Uber Shop Store in Plano. Fashion industry vendor tables available. Food, music, networking and door prizes. 21 and over event.